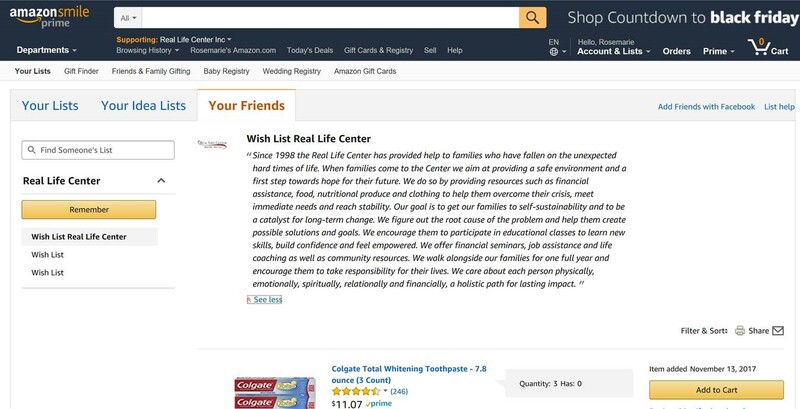 The Amazon Wish List allows the Real Life Center to share a list of much-needed items specific to the needs of our families. Amazon provides a fast and convenient way for you to donate items with ease. Please take a look at this year’s Wishlist. And don’t forget to sign up for Amazon Smile before you start shopping. Choose the Real Life Center as your receiving organization by clicking here. Amazon will donate a percentage of all your future purchases to the Real Life Center. Don’t worry! Amazon Smile is the same Amazon you already know with the same products, prices, and service. For questions, please email rlc@RealLifeCenter.org. We appreciate your support.